Hey, so apparently tomorrow (October 18) is Chocolate Cupcake Day. I don’t know who makes up these random holidays but I'm on board, are you? I love chocolate. I love cupcakes. I love cute little wrappers. I love piping bags. 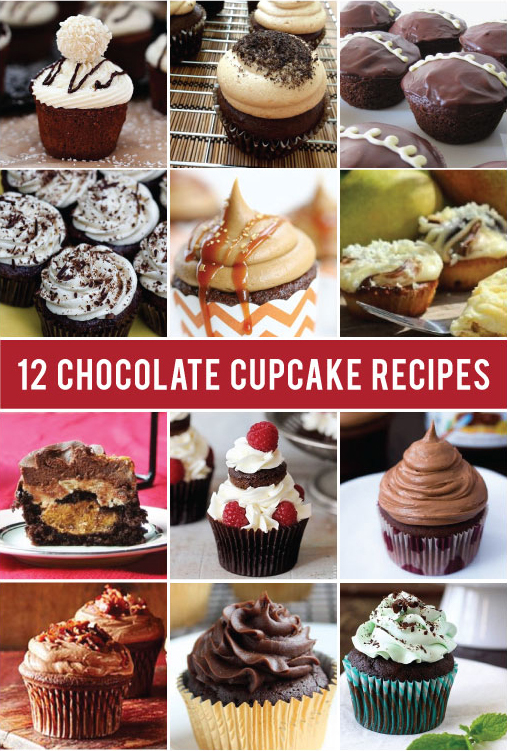 So in honor of this delicious random holiday, I assembled a collection of 12 chocolate cupcake recipes via Pinterest. Now, to decide, which recipe to try first? 1. For those avoiding gluten: flourless chocolate gluten-free cupcakes with chocolate cream cheese frosting. 2. For those avoiding gluten + animal products: gluten-free vegan chocolate cupcakes. 3. Also gluten-free + nostalgic for me (I ate a disturbing number of Hostess cupcakes in my youth): gluten-free "Hostess" vanilla-creme filled chocolate cupcakes. 4. I can never say no to this flavor marriage: peanut butter chocolate cupcakes. 5. Mmmm, coconut: chocolate cupcakes with coconut buttercream frosting. 6. For those who like a little savory with their sweet: bacon chocolate cupcakes. 7. Ever the crowd pleaser: chocolate cupcakes with nutella frosting. 8. Go big or go home this season: pumpkin pie stuffed chocolate cupcakes. 9. Classic pairing: mint chocolate cupcakes. 10. Feel less guilty by adding fruit: lemon raspberry chocolate cupcakes. 11. Different and fancy: pear and white chocolate cupcakes. 12. You had me at salted caramel: eggless chocolate cupcakes with salted caramel frosting.